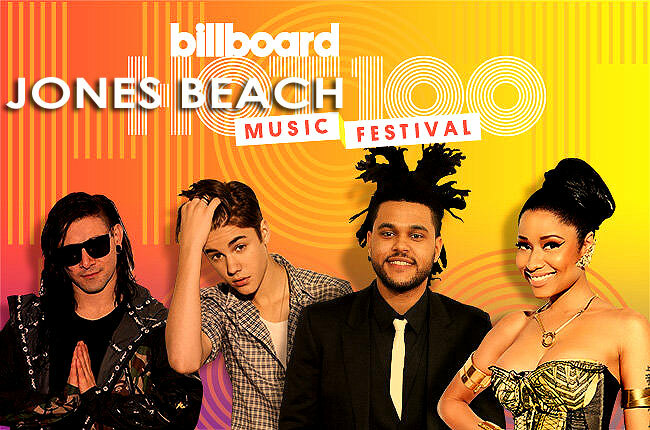 Acts include The Weeknd, Skrillex, Nicki Minaj, Lil Wayne and a special appearance by Justin Bieber. After days of hints and teases, we can finally reveal the full lineup for the first-ever Billboard Hot 100 Music Festival. The Weeknd, Skrillex, Nicki Minaj, and Lil Wayne are headlining the fest, which will also feature a very special performance by Justin Bieber. The festival hits New York's Nikon at Jones Beach Theater (and the surrounding beach area) Aug. 22-23. 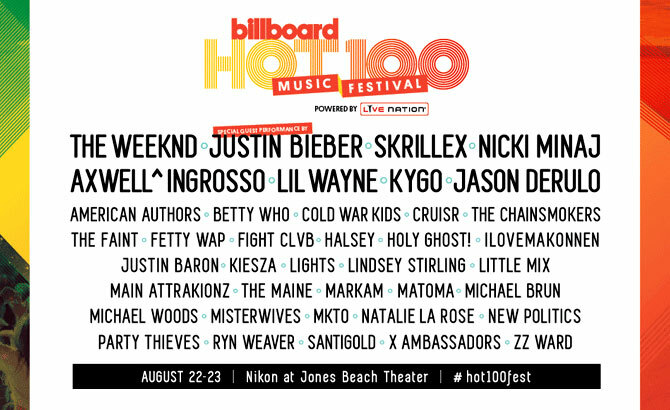 Kygo, Jason Derulo, American Authors, Betty Who, The Chainsmokers, Fetty Wap, Halsey, Holy Ghost!, Kiesza, Little Mix, Santigold, and ZZ Ward are among the 40-plus artists playing the inaugural Hot 100 Fest. Check out the full lineup below. It's a killer mix of hot hitmakers, social media influencers, rising stars and festival faves. 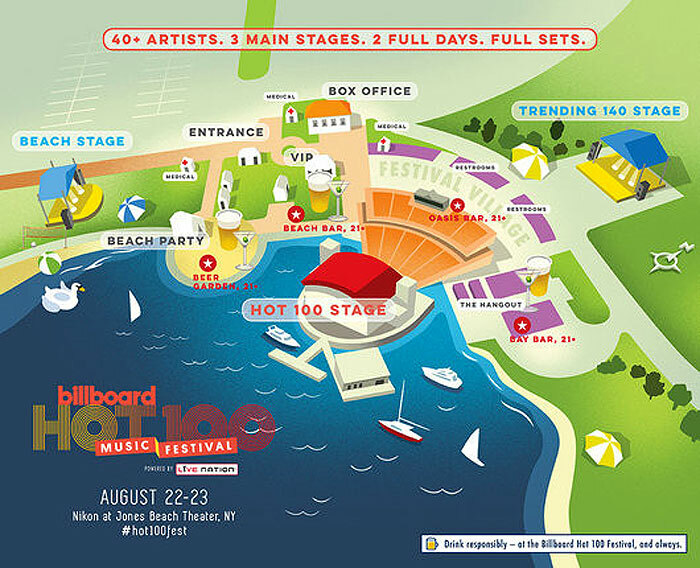 In addition to the Nikon at Jones Beach Theater, there are two additional stages nearby for Hot 100 performers -- one of which is on the beach. So yes, it's a weekend that's not to be missed. Produced by Billboard in partnership with Live Nation, the Billboard Hot 100 Music Festival is presented by MasterCard, Sour Patch Kids, Nordstrom Rack and SinfulColors. “It’s an honor to be able to extend the Billboard brand into the festival space, and we feel that Jones Beach is the perfect location to create something truly unique and unforgettable,” says Billboard co-president John Amato. 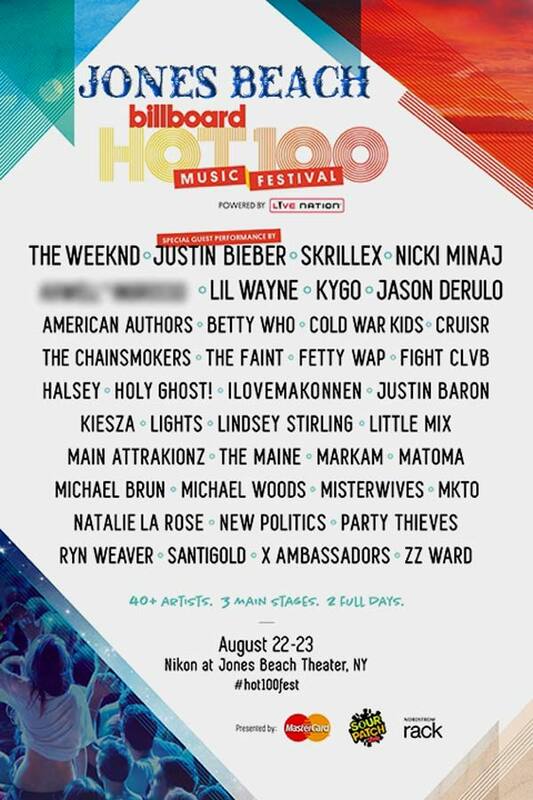 “The Hot 100 Music Festival will be one of those truly memorable summer concert events. We are very excited to bring fans some of summer 2015’s chart toppers in a venue that will showcase the best these artists have to offer,” says Live Nation President and CEO Michael Rapino. Billboard will, for the first time ever, present a concert lineup including a ton of the artists who are currently heating up their legendary Hot 100 charts! The star-studded list of performers was announced on July 10, features everyone from The Weeknd to Nicki Minaj — and a special performance by Justin Bieber! It will take place on Aug. 22-23 at Jones Beach in New York. Check out who else you can expect to see– and buy your tickets immediately! The Weeknd, Skrillex, Nicki Minaj, Lil Wayne, Justin Bieber, Kygo, Jason Derulo, American Authors, Betty Who, The Chainsmokers, Cold War Kids, The Faint, Fetty Wap, CRUISR, Halsey, Holy Ghost!, ILoveMakonnen, Justin Baron, Kiesza, Lights, Lindsey Stirling, Little Mix, Main Attrakionz, The Maine, Markam, Matoma, Michael Brun, Michael Woods, Misterwives, MKTO, Natalie La Rose, New Politics, Party Thieves, Ryn Weaver, Santigold, X Ambassadors, ZZ Ward and more! “With this first-of-its-kind festival on the beach just outside New York City, Billboard is officially expanding its live event footprint,” Billboard president John Amato said in a statement. “The iconic Jones Beach will be fully transformed into a true festival experience with multiple stages and a festival village.” Sounds totally awesome to us!